If you’re new to Lakewinds, you might have some questions about the kinds of terms and claims you’ll see on many product labels. Here are some brief overviews of what you mind find in our stores. If you have additional questions, please don’t hesitate to ask a Lakewinds staff member to help you. All-Natural: Unfortunately, in the U.S. at this time there is no regulated standard as to what constitutes a “natural” product. The FDA does not have a definitive definition, but has said it will not object to the use of the term “natural” on products that don’t contain added color, artificial flavors or synthetic substances. This means that items like high-fructose corn syrup, partially hydrogenated vegetable oils, enriched flour and sodium can be added and still considered natural. It’s critical to read food labels to understand what’s exactly in each specific product. Certified Organic: Fortunately, the USDA does have standards for certifying organic products. In order to get that seal of approval, farmers cannot have used synthetic fertilizers, sewage sludge, irradiation and genetic engineering for at least 3 years prior to be certified organic. Additional specifications dictate how close organic fields can be sewn next to non-organic fields in order to avoid “drift”. The seal lasts only 1 year, and then the farm must be re-certified. Lack of chemicals or genetic engineering while growing is a positive, but has nothing to do with the care of farm animals. Free-Range: The only standards regulated by the USDA are for poultry, and even then a “certified free-range” chicken only means the chicken has had access to the outside, with no requirements in terms of how large the outdoor roaming area may be or how long the chicken may spend in it. Consequently, many factory farms can get away with very little actual “free-range” time for their animals. Grass-Fed, Pasture-Raised: Cows are genetically disposed to digest grasses and hays more efficiently than grains, so grass-fed cows are fed as nature intended them to be. Letting cows roam a pasture and find their own grasses is healthier for them. But it’s not just better for the animals—grass-fed, pasture-raised animals have higher levels of Omega-3 fatty acids, conjugated linoleic acid, beta carotene, Vitamins B and E, calcium, magnesium and potassium. What’s more, grass-feeding, pasture-raised animals are better for the environment than grain-fed, captive animals. Genetically Modified Organisms (GMOs): GMOs involve genetic engineering used to force DNA from one species into a different species. The products developed this way don’t occur in nature or in traditional breeding. The technology is new enough that it hasn’t been thoroughly tested, so it’s not clear what affect it may have on the humans who consume these products, or even how stable the products are. That’s a problem, because the Center for Food Safety estimates that nearly 70% of processed foods in the U.S. have some GMO ingredients, and up to 85% of corn and 90% of soybeans do as well. While GMOs have not been thoroughly researched, studies that have been conducted raise concerns for both human and environmental health. Many countries around the world, including Japan, China, Australia and all of the European Union states, have either banned such foods or require that products that contain them be clearly marked. Lakewinds is proud to work with the Non-GMO Project, a nonprofit launched in 2007. 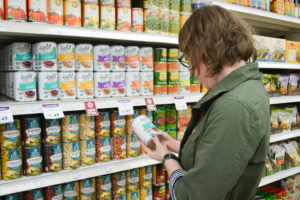 The Non-GMO Project created a third-party verification system for food producers with a consistent set of standards and processes that could be used to separate the GMO foods from the non-GMO at the grocery store. These processes include requiring every provider within a specific product to be cleared as non-GMO through audits and DNA testing. Low-risk products can be verified quickly, but more complex foods and products can take months. Becoming verified via the Non-GMO Project is a voluntary process. To date, the Non-GMO Project has verified more than 5,000 products. Products that pass can label their food with the Project’s Verification Mark, a butterfly. Look for this important butterfly on labels throughout Lakewinds.